Founded in 1904, BYRON perfectly demonstrate why British craftsmanship is a sure sign of quality. A company of many colours, it's their lighting range that shines brightest. With over one hundred years of experience in the field, they're a reliable name to put your trust in. Whether a project calls for general ambience or high levels of security, BYRON have a vast array of easy to fit lights to suit the nature of any job. Moving with the times, they even offer low wattage items that only turn on when the sun sets - allowing a home or business to show how much it cares for the environment. 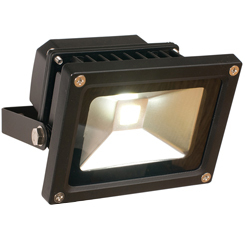 For bigger operations, the brand's range of floodlights is known throughout the world for their high responsiveness. Properly mounted on a wall, their very presence is enough to deter even the most determined of thieves or intruders. Fitted with state-of-the-art sensors, they offer illumination and peace of mind in equal quantities. Not just practical and environmentally considerate, BYRON's floodlights and lamps also hold a modern sense of style that will update all manner of buildings and fixtures. Sleek, streamlined and straight to the point, each product gives off a futuristic glow. Have a question about our Byron range? We‘ll be happy to help. Send us a message here.